Every year at Christmastime, my boss comes around to our desks at work and delivers a tin of homemade goodies. He started this tradition years ago and he gets his whole family involved in an assembly line to make tons of these tins for all of us. About 2 weeks beforehand, I start drooling thinking about this one cookie in there. 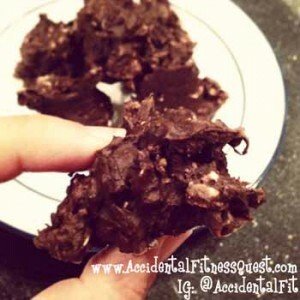 It’s a chocolate peanut butter oatmeal no bake cookie that melts in your mouth and is screamingly delicious. We lovingly call them doo doo cookies because they resemble a pile of poo. Lemme tell you if they ever decide to not include these, there will be quite a few tears at work. OK, maybe just tears from me. Now for the reason I’m rambling about these piles of joy. The other day I wandered past a co-workers desk and spied those very cookies! His girlfriend had made them and it’s not even Christmas. Much like Pavlov’s dogs, I found myself unable to concentrate on anything but the cookies. I managed to resist since they are full of milk, sugar, butter, peanut butter and so on. This is not the time to derail me from my task at hand. However, I pondered remaking them somehow so that I could actually enjoy them. Mix all ingredients in a bowl until blended well. Depending on the size of your scoop of protein, you may need to play with the amount of water to get it to a thick batter consistency. Drop by large spoonfuls onto waxed paper and freeze for 30 minutes. Remove from freezer, eat, lick fingers, and wish for more. The calories per cookie will vary depending on how big you make your spoonfuls. I made 6 cookies with my batch… and wanted to eat them all. Calories for the entire recipe are approximately 454 calories – 38g protein, 32g carbs, and 20g fat. Divide this by the number of cookies your batch made. The protein I used for this recipe was Phase 8 Milk Chocolate flavor which is a protein blend. I also used Hershey’s Special Dark baking cocoa since that’s what I always use in my recipes. You can use regular baking cocoa in place, but if you have the chance pick up some Special Dark the next time you’re grocery shopping. It’s so much more chocolatey than the other. Chocolatey = better in my mind. If you try it out, let me know what you think. As a side note: I made the exciting decision this week to put together a cookbook with some of my creations. The recipe above is a variation of the one that will appear in my ebook but not the exact one. The final version will be lower in calories and fat than this version but still with the same great taste! Look for random pics and mysterious hints of recipes to come over the next few weeks as I play around in my Quest Kitchen. If you’re on Instagram, come on over and get sneak previews as I try things out.